If you’re looking for back to back pull handles for internal doors that can be open either way, the most reliable types use the bolt through fixing, both for ease of fitting and to stand up to all the handling they’ll get. 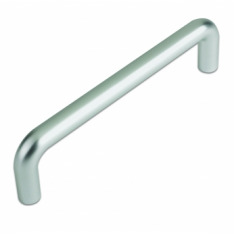 We supply a wide range of bolt through pull handles for sale. If you’re going to buy bolt through pull handles, your first problem is that doors aren’t all one single size, and getting the wrong size of pull handles would make them awkward to use as well as looking ungainly. Fortunately, we have a broad selection of sizes, from 150mm to 1800mm. For those looking to buy bolt through pull handles with a bit more old-world charm, we have an elegant 500mm Polished Brass Reeded Grip Bolt Through Pull Handle, as well as various sizes of Polished Brass Bolt Through D Pull Handle. Besides bolt through pull handles, we have a full choice of pull handles and plates for sale, including pull handles on rose, pull handles on plate, face fix and cranked handles, cabinet and kitchen handles, flush pulls, kicking plates and push plates.